So many thanks, to so many people, for making my book, Rewire Your Brain for Love: Creating Vibrant Relationships Using the Science of Mindfulness (Hay House, 2013) a continued bestseller! I loved writing it, bringing together my psychologist side (I’ve been practicing psychotherapy for 25+ years), my “brain geek” side (I’m also a neuropsychologist), and the practice of mindfulness, which I’ve used personally and professionally in various forms for more years than I can count. For those of you who are interested in reading a free excerpt — maybe to check it out for yourself, maybe to share with a friend / significant other / spouse — I’m posting this free PDF excerpt from the beginning of the book. Click on the image of the book below, and you can read the excerpt online or download it. I hope you find it helpful! Click on the book to read and download an excerpt! The way your brain is wired can either help you have happy, satisfying relationships or it can be a huge obstacle to healthy love. 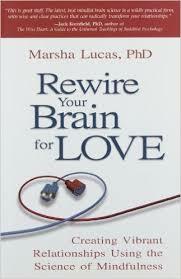 The good news, though, is that you can rewire your brain for better relationships. You can change your old “relationship brain” neural pathways and develop new and improved ones using simple, 2,500-year-old mind-training techniques that are more precise than a neurosurgeon’s blade, and without all the mess. The ancient practice of mindfulness meditation, as it turns out, produces real, measurable changes in the brain in key places so that deeper connections, better love, and healthier relationships can really take hold. In as little as 20 minutes a day. Whaddaya think? Are your relationships worth 20 minutes a day? So how exactly do you change those structures and connections into supporters of happy relationships? Recent studies by leading neuroscientists and biobehaviorists—researchers from Harvard, UCLA, MIT, Princeton, Stanford, and Cambridge, to name a few—have shown that mindfulness practice promotes changes in your brain in areas and ways that promote healthier relationships with yourself and others. The neurological changes seen in the brains of mindfulness meditators show up in how they feel, how they deal with their feelings, and how they do relationships. And it doesn’t take years of practice—many beneficial effects are seen in the earliest stages of practice, in as little as a few weeks of practicing 20 minutes a day. Can’t do 20 minutes? That’s perfectly okay; start with two. You don’t have to become a monk or a vegetarian or spend hours contemplating your navel. You don’t need to hum “Om” over and over, trying to get your brain to be still or empty. What you do during mindfulness meditation is practice simply noticing your mind’s busyness (a.k.a. your thoughts and feelings) and not getting all tangled up in it. You don’t even have to sit while you do it (and you definitely don’t have to sit like a pretzel). You can do walking meditation, eating meditation, lying-down meditation, or even washing-dishes meditation. With practice, you can meditate anywhere, during just about any activity. By using simple mindfulness meditation, you can rewire your brain’s relationship pathways—and change your life. This book is about why and how to use mindfulness meditation as a simple, good-for-you approach to rewiring your brain for better, healthier, juicier romantic relationships. Consider this: developmental psychologists talk about essential characteristics that are seen in people with healthy, attuned childhood relationships—characteristics that bode incredibly well for these people’s ability to have healthy relationships in adulthood. And then this: those same characteristics are seen in people who practice mindfulness—plus bonus characteristics. To top it all off: the latest scientific research has increasingly been showing that these characteristics are associated with areas of the brain that change as a result of mindfulness. In the work I do with my patients, I’ve seen that the growth of these seven characteristics has such an important impact on interactions with others that I call them the “high-voltage” relationship benefits. I’ve been seeing the results confirmed through my psychology practice, in myself, and in the lives of my friends and colleagues. I want you to benefit as well.